1Departamento de Solos e Adubos, Faculdade de Ciências Agrárias e Veterinárias, Universidade Estadual Paulista Júlio de Mesquita Filho, Via de Acesso Prof. Paulo Donato, CEP: 14884-900 - Jaboticabal, São Paulo, Brasil. Potassium contained in sugarcane straw quickly returns to the soil in a form readily available to crops. Thus, the objective of this study was to evaluate the effect of potassium on the nutritional status and grain yield of peanutscultivated in succession with sugarcane harvested without burning. The experiment was installed in Jaboticabal, São Paulo, Brazil, in Dystrophic Red Latosolcultivated with the peanut crop, variety Runner IAC 886. The treatments consisted of the application of 30, 60, 90 and 120 kg ha-1 of K2O and a control (no potassium). The experimental design adopted consisted of randomized blocks with five replications. Parameters evaluated were height, diameter, number of leaves, nutritional status for potassium and grain yield. Potassium resulted in a significant increase in the number of leaves and height, K contents (50-70 g kg-1) and grain yield, obtaining 2790 kg ha-1 at a dose of 120 kg ha-1. The sugarcane straw alone is not sufficient to meet the nutritional needs of peanuts planted in succession with sugarcane, where application of potassium fertilizer is necessary to obtain high yields.Potassium fertilization improved the nutritional status and was reflected in the increased production of grains of peanuts grown in rotation with sugarcane, especially at the dose of 120 kg ha-1 K2O. The peanut is the fourth most widely cultivated oilseed in the world, planted on a large scale in the America continents, Africa and Asia, mainly for the purpose of grain, oil and meal production. In Brazil, the total planted area is 94 thousand hectares and a production of 326 thousand megagrams of grain was reported in the 2012/2013 harvest (CONAB, 2013); it is widely cultivated in rotation with sugarcane, harvested without burning in potassium-deficient soils. Sugarcane harvest without burning maintains plant residues on the soil surface, which includesdry leaves, pointers, green leaves andportions of the stems forming a mulch referred to as straw, varying from 10 to 30 Mg ha-1 in dry matter with a C:N ratio near 100 (Trivelin et al. 1996, Cantarella, 1998). In the straw, potassium does not remain incorporated in the carbon chains, so that after harvest or senescence of the plants, it returns to the soil in a readily available form for subsequent crops, making the straw a significant reservoir of K (Yaday et al., 1987; Rosolem et al., 2003) in conservation farming systems. However, in crops following the harvest of sugarcane, total liberation of K from the straw does not have enough time to occur, especially when considering short cycle annual crops. Straw incorporated into the soil can improve not only the chemical properties, but also the physical and biological properties to increase the production potential of the peanut crop. Potassium is the second most absorbed nutrient by the peanut crop (Tasso Júnior et al., 2004), and it playsvarious metabolic functions in plants including photosynthesis, protein synthesis, activation of several enzymes and functioning of the stomata (Hawkesford et al., 2012), and also presents a beneficial effect on nitrogen fixation and translocation of photosynthates from the leaves to the root nodules (Savani et al., 1995). In soils with low potassium contents (less than 1.5 mmolcdm-3), it is expected that the peanut respond expressively to application of K fertilizer. Some studies have highlighted the importance of potassium fertilization on the peanut crop, emphasizing its effect on development, nutrition and production (Pradyut et al., 2006; Reddy et al., 2011; Sharma et al., 2011; Lobo et al., 2012); in addition, some studies have confirmed the economic feasibility of potassium nutrition in this legume (Veeramani and Subrahmaniyan, 2012). The appropriate dose of potassium to be applied to the soil may be affected by climatic conditions, genotype and the crop production and/or rotation system adopted. The official recommendation of potassium fertilization for the state of São Paulo in the peanut crop was proposed in the 1990,s (Quaggio and Godoy, 1996), indicating moderate doses of potassium (60 kg ha-1 K2O in soils with low content of the nutrient) because the culture is considered rustic, being little responsive to fertilization (Cope et al., 1984; Cox et al., 1982). In recent years changes to the cropping system of peanuts have been made, especially with the emergence of new genotypes more responsive to fertilizer use and changes in the crop rotation system with sugarcane, favoring the crop production potential. Potassium fertilization on the peanut crop in areas with presence of the remaining sugarcane straw and the use of more macronutrient-demanding genotypes may induce the need for increasing potassium doses. Given the above, the objective of this study was to evaluate the effect of potassium on the nutritional status and grain yield of peanuts cultivated in succession to sugarcane harvested without burning. The experiment was conducted at the Fazenda Santa Teresa, located in the municipality of Jaboticabal-SP, Brazil (21°06´25´´S; 48°15´12´´W) in Dystrophic Red Latosol with clayey texture (EMBRAPA, 2006). The experimental area was cultivated with sugarcane in succession with peanutsfor thirty years, and in recent years managed in the conservation system. Before implementation of the experiments and after harvest of the sugarcane ratoons, 15 soil subsamples were collected in each area at the layers of 0 to 20 and 20 to 40 cm deep, to make up the composite sample,which was used for performing the chemical analysis to evaluate fertility (Raij et al., 2001) and particle size (Camargo et al, 2009) (Table 1). Liming was not needed because the base saturation of the soil was suitable for the crop (Raij et al.,1997). Table 1. Chemical attributes and particle size distribution of Dystrophic Red Latosol at two depths after harvest of sugarcane ratoons. The treatments were based on the reference dose (60 kg ha-1 K2O) for the state of São Paulo (Quaggio and Godoy, 1996), being: 0, 30, 60, 90 and 120 kg ha-1 K2O, corresponding to 0, 50, 100, 150 and 200% of the reference dose, respectively. The experimental design consisted of randomized blocks with five replications. The potassium source used was potassium chloride (60% K2O), applied beside the crop rows without incorporation. Applied to the fields were 100 kg ha-1 P2O5 in the form of triple superphosphate and 20 kg of S in the form of gypsum. The plots were composed of four rows measuring 10 m long, spaced 0.90 m apart, totaling an area of 36 m2 per plot; the two central rows were considered useful at the time of each sampling. Data of rainfall and maximum and minimum temperatures were obtained for determining the extract of the water balance recorded during the experiment (Figure 1). The local climate was classified as Aw Tropical rainy with dry winter and the coldest month presented an average temperature greater than 18ºC. It was observed that the driest month showed precipitation lower than 60 mm, where the rainy season began in the fall. Figure 1. Representation of the extract the thewater balance (Thornthwaite and Mather, 1955) for soil evaluated in the city of Jaboticabal, SP - Brazil, from September 2010 to August 2011. DEF: Deficit; EXC: Surplus. Mechanized harvest of sugarcane was performed on 08/07/2010, and on the same date the straw was incorporated into the soil. Sowing of the peanuts was conducted two months after incorporation of the straw, at a density of 16 seeds per linear meter with the cultivar Runner IAC 886, which presented acreeping growth habit. Weed control was performed by applying the herbicide trifluralinprior to planting and incorporated into the soil (890 g ha-1 of i.a.) and supplemented with mechanical control before closing of the crop. Growth was evaluated at 120 days after germination of the crop, of 10 plants, considering three locations along the rows from the useful area of each plot. Parameters determined were: height of the main stem, corresponding to the distance between the base of the stem and the last fully developed leaf of the plant, diameter of the stem obtained using a digital caliper at the base of the plant, and number of leaves per plant. At full flowering of the peanut crop, 50 plants were sampled per plot by removing the apical tuft from the main stem, according to the indication proposed by Ambrosano et al., (1996). The plant material was dried in an oven at 60-65 ºC until reaching constant weight and then ground in a Wiley mill for subsequent determination of potassium (Bataglia et al., 1983). Harvest of the peanuts was performed per plot on 03/10/2011, at 145 days after germination. Plants were separated by treatment and placed in a screened greenhouse for five days for pre-drying of the peanut, maintaining the plants with the pods facing up. After drying it was proceeded to manually remove and separate the pods from the grains, and later, the grains were weighed to calculate of the yield expressed in kg ha-1. The data obtained was subjected to individual analysis of variance by the F-test. To study the effect of K rates on the variables studied the significant polynomial regression analysis was used along with the greatest values of the coefficients of determination (R2). The K doses affected height of the peanut (F = 5.51**), however other growth variables in both soils were not affected. Average diameter of the plant stem was 5 mm. The number of leaves (Figure 2) and the height of the peanut (y= - 0.00055x² + 0.0753x + 28.68; R² = 0.34) increased quadratically, but the latter was of low agronomic importance due to the low coefficient of determination. There was an effect of K doses on the leaf concentration of this nutrient in peanuts (F=7.04**). Foliar potassium levels ranged from 50 to 70 g kg-1. 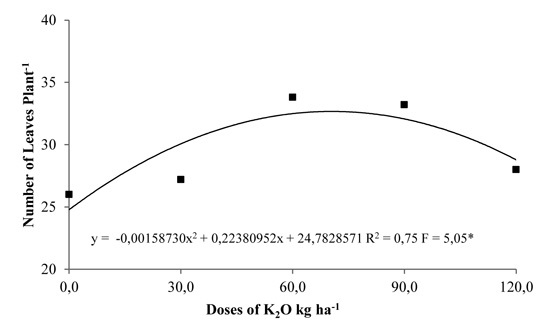 In all treatments the K concentrations are found above the adequate range for the crop (17 to 30 g kg-1 of K) (Gascho and Davis, 1995; Ambrosano et al. 1996). 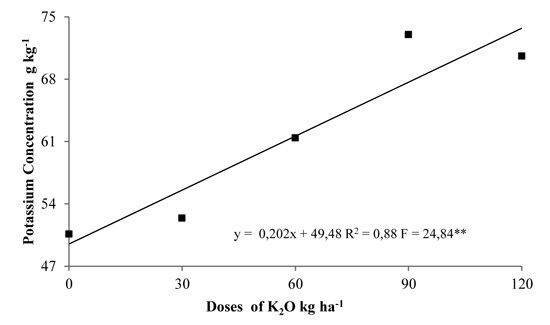 Potassium application caused a linear increase in leaf content of this nutrient in the peanut crop, reaching a content of 70 g kg-1 for the dose of 120 kg ha-1 of K2O (Figure 3). Figure 3. Effect of potassium application on the leaf potassium concentration for the peanut cultivated in Dystrophic Red Latosol. * - significant at 1% (*p<0.01) probability by the F-test. The production of peanut grains was also affected by potassium application (F=21.39**). Potassium levels linearly increased the production of peanut grains, where for the dose of 120 kg ha-1 of K2O production reached 2790 kg ha-1 of grain (Figure 4). Figure 4. Effect of potassium application on yield for the peanut evaluated at 120 days after planting in Dystrophic Red Latosol. * - significant at 1% (*p<0.01) probability by the F-test. The increase in productivity was approximately 1187 kg ha-1 between the control treatment and highest dose of K2O. It was observed that the highest yield is associated with leaf potassium content equal to 70 g kg-1 (Figure 3), above the levels indicated as adequate for the crop according to Ambrosano et al. (1996). Increase in plant height and number of leaves of the peanut crop may be linked to adequate water availability in the experimental area during the experimental period. The diffusion process, responsible for transporting much of the K+ to the root surface, is highly dependent on water in the soiland may have benefited from the period of high soil moisture content, directly affecting crop development (Oliveira et al., 2004; Raza et al., 2013). A beneficial effect of potassium on height of the peanut was observed by Pradyut et al. (2006), however Lobo et al. (2012) did not encounter this effect. Basha and Rao (1980) found that the effect of potassium on the number of leaves may be attributed to the function of the nutrient in transport of carbohydrates, increasing photosynthesis. Moreover, potassium plays an important role in the hormonal balance, influencing the increase in the level of auxin, an important hormone for plant growth (Rubio et al., 2009). The high concentrations of K obtained, especially in the treatment without application of the macronutrient, may be associated with the residual effect of sugarcane straw, which was incorporated into the soil before planting the peanuts. This contributed to the supply of this nutrient in soil due to its high and quick liberation capacity, which was also verified by other authors (Rosolem et al., 2003; Oliveira et al., 1999), where 70% of the total K present in the sugarcane straw may be released within 120 days of decomposition (Yaday et al., 1987). Potassium is the second most absorbed nutrient by sugarcane and because it remains almost entirely in the ionic form within the plant tissue (Hawkesford et al., 2012), its exit from the cell is facilitated after rupture of the plasma membrane, therefore collaborating with the increase of this nutrient in the soil. The beneficial effect of potassium fertilization evidenced in the peanut crop was due to the low levels of exchangeable potassium in the soil layers of 0 to 20 cm (0.5 mmolcdm-3) and 20 to 40 cm (0.4 mmolc dm-3) of depth (Table 1), and as a result of its application there was an improvement to the nutritional status of potassium (Figure 3). Thus, it can be inferred that potassium fertilization, along with the K released from the straw, increased the availability of this nutrient in the sorption complex and in the soil solution, permitting better absorption of nutrients as evidenced by the nutritional status of the crop, therefore favoring the increase in grain production. 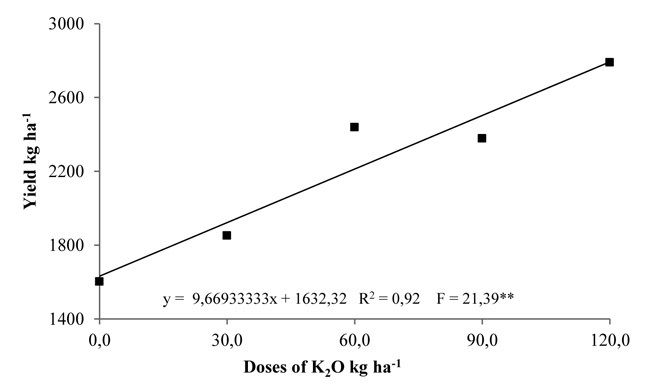 The beneficial effect of K on grain production is related to its known role in plant nutrition, in many physiological and metabolic processes,including photosynthesis, osmoregulation, transport of nutrients, transport and storage of carbohydrates, nitrogen absorption and synthesis of proteins and starch (Hawkesford et al., 2012; Raza et al., 2014). These differences between the optimum foliar potassium concentrations (70 g kg-1) found in this work and in literature (Ambrosano et al., 1996), are possibly due to the cultivation systems of the present study, which included the presence of sugarcane straw incorporated into the soil, modern genotypes and different climatic conditions to those used in the work of Ambrosano et al. (1996) to establish foliar concentrations adequate for the culture. Mathew et al, (1983), Pradyut et al., (2006) and Reddy et al., (2011) also found beneficial effects of potassium fertilization on peanut productivity. Assessing the effect of potassium doses in the peanut crop in two application forms, Sousa et al. (2013) obtained 1531 kg ha-1 at a dose of 69 kg ha-1 of K2O by the fertigation method, while for the conventional method the maximum estimated yield was 1092 kg ha-1 with application of a dose of 66 kg ha-1 K2O. These values are lower than those obtained in the present study, even in the control treatment which had a yield of 1623 kg ha-1. 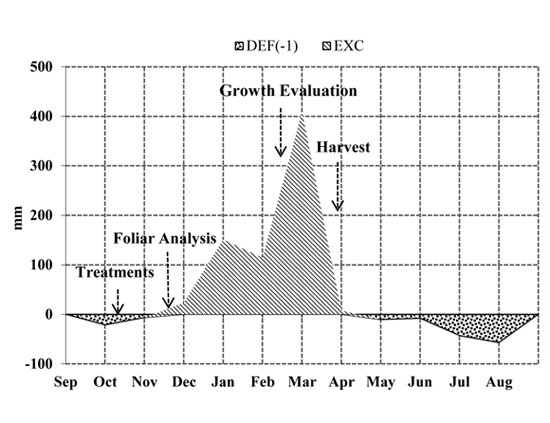 It was observed that the crop reached such high productivity probably due to the optimal climatic conditions during the experimental period (Figure 1) and use of a cultivar with high production potential, a factor which possibly favored the response of the crop to potassium application. However, in crops with lower production potential (<1300 kg ha-1 of grain) no effect of potassium on productivity was verified (Lima, 2011). In peanut fields with production potential close to 2800 kg ha-1 of grains, in rotation with sugarcane, it is suggested to increase the indicated potassium dose from 60 kg ha-1 (Quaggio and Godoy, 1996) to at least 120 kg ha-1 K2O. It is noted that there is a need for more studies utilizing higher potassium doses than those evaluated in this study to accurately define the maximum dose of fertilizer to be used. Sugarcane straw alone is not sufficient to meet the nutritional needs of peanuts planted in succession with sugarcane, where application of potassium fertilizer is necessary to obtain high yields.Potassium fertilization improved the nutritional state which was reflected in increased grain production of the peanut crop cultivated in rotation with sugarcane, especially at the dose of 120 kg ha-1 of K2O.